Downriggers are used when trolling for fish far below the surface, which requires lures or bait to be kept at a specific depth while the boat is moving. Downriggers use a heavy weight to keep the lure much deeper than would be possible with a conventional sinker. By presenting the bait or lure at the desired depth while trolling, various species of fish (salmon, walleye, king mackerel) are easier to attract and catch. The downrigger consists of a mounting bracket, a spool for the stainless steel cable, a boom of fixed or varying length to allow the line to clear the boat's gunwale, a clutch/brake mechanism to control the weight deployment and retrieval, 100 - 300' of cable and, in many cases, a rod holder. Saltwater downriggers feature components made from corrosion- resistant materials like glass-reinforced polycarbonate, anodized aluminum and stainless steel. 1. The fishing line is hooked to the line release mechanism. Next, the length of the leader between lure and weight has to be determined. 2. The reel is put into free-spool mode with the click engaged or kept in gear with very light drag so weight and lure can be lowered to the desired depth, which is shown on the cable footage counter. Excess line is wound back onto the reel until the rod tip bows downward. 3. When a fish strikes, the release mechanism is tripped. This separates the fishing line from the weighted downrigger cable. 4. While the weight is returned to the downrigger, the line runs free to play and land the fish. Manual or Electric: Downriggers are available in manual or electric models. For fishing greater depths we strongly recommend electric models because a 12V DC motor can retrieve the weighted cable at speeds of more than 200'/min on fast models, which is hard to match by cranking a manual spool. Sophisticated electric downriggers can retrieve the line automatically while the angler fights the fish, and stop when the weight breaks the surface. Some high-end models can interface with fishing sonars or fishfinders, or they can be programmed to jig the lure automatically to attract fish. For smaller boats we recommend manual models, which are more economically priced, lighter and more compact. Mounting Options: To maximize performance, downriggers can be mounted in a variety of positions, depending on the type of boat. As mentioned above, some small units simply clamp to the gunwale while others attach to a fixed mount that offers strength and durability at the expense of flexibility. Tilt mounts offer one fixed mounting position for fishing but slant the downrigger inboards for docking purposes. In our opinion, the most versatile method of mounting a downrigger use pedestal/swivel mounts. The advantages are obvious: they offer 360 degree rotation and multiple locking positions for maximum control and convenience during fishing. They also allow the downrigger to be swung out of the way for docking. If drilling holes into your boat for permanent mounting brackets is not your cup of tea, gimbal mounts that slide into flush-mounted rod holders are a practical alternative. The drawback of this system is the necessity to lift the downrigger out of the rod holder when the boat docks. Portable models that attach to the gunwale with a C-clamp are practical for very small craft or boats that are rented for an afternoon of fishing. Horizontal or Vertical Reels: This is largely determined by which manufacturer's products you prefer; Scotty is generally known for horizontal spool design, which provides a "low profile, for easy winding and compact storage" while Cannon and Penn use vertical reels. 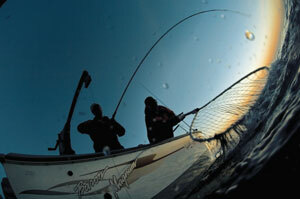 We recommend trying to fish on boats that use both styles to see which one is right for you. Boom Length and Style: Generally, bigger boats should use downriggers with longer booms to ensure that the weight swings clear of the topsides. But storing units with long booms is a hassle; so many models have the option of a telescoping boom to allow compact storage. For heavy weights, a rigid stainless steel boom may be a better choice because of its greater stiffness. Clutch/Brake Mechanism: All downriggers have a clutch/brake mechanism to control the deployment and retrieval of the weight. One feature we like is a combination of brake and clutch on the reel like the one offered by Penn, to allow simple, one-handed operation. This is especially useful when fishing alone. Retrieve Speed and Amp Draw: Retrieve speed is important when fishing deeper waters and low amperage draw is easy on the battery, which is important on boats with limited power supply. Currently, Scotty offers the fastest retrieval speeds and the lowest amperage draw for a given workload for electric downriggers ( e.g. 235'/min @ 5 amps for a 7-pound weight). The speed for manual retrieval depends on your arm strength, cranking technique and the size of the spool. If one revolution of the crank takes up 2'of cable, it requires 100 revolutions to wind up 200'. Combined with a 10 lb. weight that is a pretty good workout. Bottom Tracking and Automatic Jigging: Cannon offers electric downriggers with a bottom tracking feature that keeps the weight at a pre-set distance to the bottom when used with a transducer mounted on the stern of the boat. Following the contours of the sea floor at consistent distance, it keeps the lure in or near the habitat of the species you're fishing for. Another advanced feature is the ability to pre-program multiple depths and cycle them automatically, which creates a jigging motion of the lure that attracts fish. Downriggers are a must-have for trolling in deep water. Selecting the right model for your fishing style depends on where you fish, how deep you want to go, what type of boat you fish from and the number of features you want. Fishing on the ocean requires downriggers made from sturdy, corrosion-resistant material. Electric models are better for fishing great depths because of their faster retrieval rates and added convenience. Manual models are lighter, more compact and more economically priced. The larger the boat, the longer the boom needs to be to keep the weight from banging against the topsides. Telescopic booms make it much easier to transport and store the downrigger. Clutch/brake systems on the reel control the deployment and retrieval of the cable and should enable you to keep one hand free for fishing, especially when you are alone. Swivel mounts provide more convenience and control than fixed mounts. Tilt and gimbal mounts are other ways to affix a downrigger to gunwale or railing and position it to give you the best fishing results.